I will definitely try SF again! Definitely give SF another go, I thought it was outstanding. I also loved her collection of short stories that Persephone publish: Dimanche and other stories, which includes some interesting Mother-daughter relationships. What a fantastic find in the Samaritans Book Cave! Great review, Karen. I have to agree with Helen and Ali, it’s worth trying again with Suite Francaise (especially given your success with The Ball). When I was at school a girl wrote a short piece in our magazine, which I thought was amazing, very poised, mature and sensitive, about a mother/daughter relationship. After I read The Ball I wondered if she’d been inspired by reading that. As someone who didn’t get on well with my mother, I found it both and unsettling and memorable read. 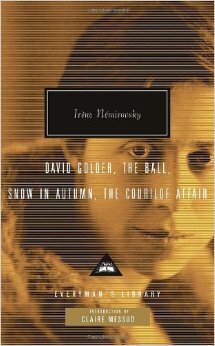 From what I’ve heard, Nemirovsky had issues with her own mother and that element certainly seems to inform her fiction. And it made for a powerful story here! I have never read SF, but of course have a copy and should get to it. I may even have your Everyman collection of Nemirovsky: at least I have one that I found at a book sale. No idea whether there is more than one! Some very good books I seem never to get to. The Ball with its mother-daughter issues sounds wonderful and perhaps I should skip SF, which for some reason I have always thought I should read first! God knows why. I definitely don’t think you need to read SF first – in fact, I didn’t, and I actually think reading her earlier, shorter works first helped me with my reading of SF! Go for the Everyman volume, definitely!